A handout picture released by Stockholm University taken on July 31, shows Gunhild Ninis Rosqvist, a Stockholm University geography professor making measurements of the glacier atop Sweden's highest point on the southern peak of the Kebnekaise mountain in Sweden's far north. Researchers expressed concern Thursday about the rapid pace of climate change, after a glacier on Sweden's Kebnekaise mountain melted so much in sweltering Arctic temperatures that it is no longer the country's highest point. "It's quite scary," Gunhild Ninis Rosqvist, a Stockholm University geography professor who has been measuring the glacier for many years as part of climate change research, told AFP. "This glacier is a symbol for all the glaciers in the world. This whole environment is melting, the snow is melting, and it affects the entire ecosystem: the plants, the animals, the climate, everything," said Rosqvist, who is also the head of the Tarfala research station near Kebnekaise. "You see the effects of climate change so clearly here. And for Sweden, Kebnekaise's southern peak is such an iconic symbol." A popular tourist destination located in Sweden's far north, Kebnekaise has two main peaks—a southern one covered by a glacier and a neighbouring, northern one free of ice. The southern peak lost four metres (13 feet) of snow between July 2 and July 31. "It looked different this year. The snow was melting, the glacier surface has never been as low as it is now. I saw meltwater trickling down the sides, I've never seen that before," Rosqvist said. When measured early Tuesday, the southern peak reached 2,097 metres above sea level, just 20 centimetres higher than the northern tip's 2096.8 metres. On a daily basis in July, the southern peak lost an average 14 centimetres of snow, as Sweden registered record hot temperatures that triggered dozens of wildfires across the country, even in the Arctic Circle. On Thursday Rosqvist said the southern peak was most certainly lower than the northern peak. "We haven't gone up today to measure it, but we've checked the temperature and it was really warm yesterday, it was over 20 degrees C (68 F) so it has surely melted", below the level of the northern peak, she said. 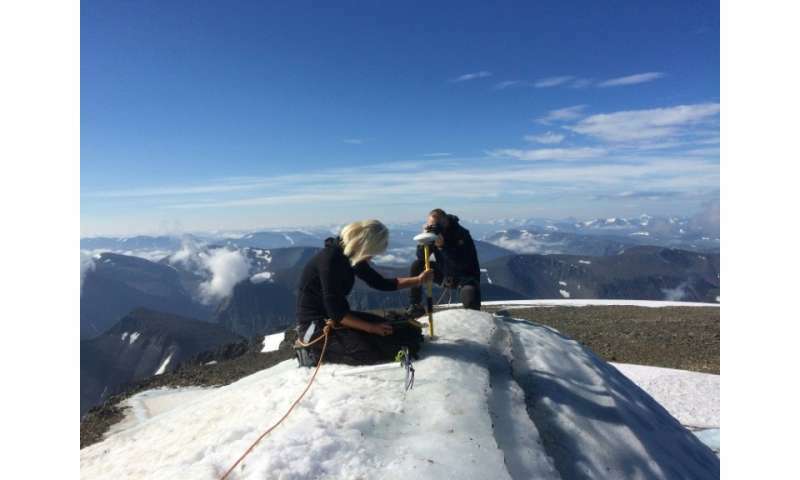 Rosqvist and her team will measure the peak again around September 8, "when the summer is over." "It could easily be a metre under the northern peak by the end of summer." The southern glacier, whose height has been registered since 1880, has been melting by one metre every year over the past two decades, according to Stockholm University. The glacier could grow this coming winter and the southern peak could even rise above the northern peak again, before some of it melts away next summer if the weather is warm. According to Martin Hedberg, meteorologist at the Swedish Weather and Climate Centre, "extreme heat is 100 times more common today than it was during the 1950s, 60s and 70s" globally. "The temperature differences between the Arctic and the Mediterranean are narrowing," he told AFP. Kebnekaise's two peaks may compete for the title of Sweden's highest point for the next few years, Rosqvist predicted. She lamented that political targets to combat climate change, including the Paris Agreement which calls for capping the global rise in temperature at 2 C, were not having enough of an impact. "With these targets, our glaciers are going to disappear." "It's an election this year in Sweden, and yet no one is talking about this," she bristled, referring to the country's general election on September 9. With the last three years being the hottest ever recorded on Earth, she said changes were needed "in the way our societies are structured" to reduce greenhouse gas emissions. She cited cuts in fossil fuel usage and more electric cars as examples. "Many people want these changes, and they're prepared to change their consumer habits," she added.